Sonoma Academy’s Andre Williams definitely made third times a charm as he became the Redwood Empires first ever boys division V State Champion. Williams running the fastest Empire time of all five divisions (15:36) gave the Coyotes their fourth state championship in five years following the three others by Rylee Bowen. Williams had placed 4th last year for the Coyotes and 15th his sophomore year while at Kelseyville. Only 1998, when the Empire won three individual Championships by Ryan Mack, Ukiah D2 and Celedonio Rodriquez, Elsie Allen and Sara Bei, Montgomery, both D3, has our area had more Champions than the two won today by Williams and Gabriella Peterson in the girls race. Williams battled St. Margarets Jackson Adelman for the first 2 1/2 miles of the race before pulling away to the win. But there was plenty of more excitement in this race for the Empire as Rincon Valley Christian tied the Empires best ever team finish in this race at fourth in their schools first appearance here as a team. Don’t be surprised to see them do even better next year as the team was lead by two sophomores Brady English (17th 16:30) and Simon Peterson (26th 16:46) with a third sophomore Dante Benedetti (69th 17:33) in their top four. Seniors Isaac Methum (41st 17:06) and Zachary Passalaqua (97th 17:49) completed the Eagles scoring team with senior Scott Dolan and junior Gabe Kim completing the podium team. Giving us even more to look forward to next year are three more underclassman who all showed well this year. Healdsburg sophomore Jack Vanden Heuval had his schools best place ever at 27th (16:51) bettering the 28th placing by Hector Delgado in 1992. Cloverdale junior Paden Collard finished in 33rd at 16:55. Junior Aidan Barker became Technology’s first ever boy to qualify for state finishing in 52nd at 17:20. 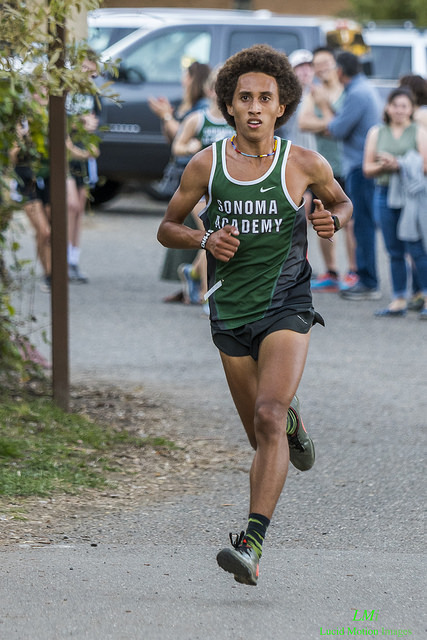 Many had their eyes up front on the NCS’s own Liam Anderson of Redwood who would run the fastest time of the day at 14:56 and win by over 10 seconds but the Redwood Empire had a great showing themselves with Maria Carrillo’s podium winning team plus a twelfth place finish by Windsor’s Lucas Chung. Chung held back crossing over the first mile in 28th place. But over the next two miles he would pass 16 runners for his top 12 finish in 15:51. Right after Chung came the Puma’s first runner junior Rory Smail in 13th at 15:53, making him the fourth underclassman to finish in this race. Colton Swinth (23rd 16:02), Pierce Kapustka (30th 16:14), Will McCloud (85th 16:50), Elijah Ettedgui (104th 16:59), Patrick Philip (135th 17:22) and Omar Alvarez-Hernandez (163rd 17:43) made up the medal winning squad. Only seven Empire teams in the 30 plus years of this race have run a faster team time than this years Puma squad. And the best news is the whole team, except senior McCloud are back next year. Vintage sent two runners into this race. Emmanuel Guzman ran one of the Empires 20th fastest times ever here in 15:45 to finish in 22nd. Teammate Dylan Frye ran a fast time himself for a junior finishing in 111th in 16:37. 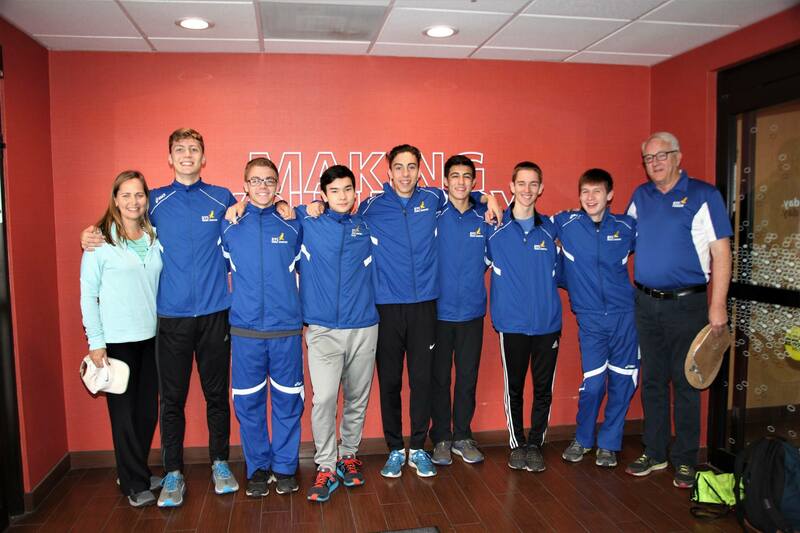 Piner boys made their seventh top 20 finish at State taking 17th this year. The team as usual was lead by senior Nathan Hayes (58th 16:44). Completing the Prospectors were Emmanuel Delgado (111th 17:20), Jeremiah Cano (112th 17:20), Addison Gaspar (146th 17:50), Jimy Garcia (150th 17:53), Tyler Mezey (175th 18:17) and Juan Vazquez (188th 18:40).